Is Full Service Right for You? Review our policies and program details to determine if the Full Service program is right for you. Complete our online application to let us know what you’re looking for. Once we receive your application, our staff will give you a call to book your consultation! Enjoy your 30 minute consultation with one of our arborists. During your consultation, we will assess your yard, ask you about your preferences and help you select appropriate species for your yard. At the end of the consultation you will purchase your trees and shrubs! LEAF will plant your trees and shrubs! We will contact you at least two days in advance to let you know when we will be coming by, but you do not need to be home for planting, as long as we can access your backyard all day. Care for your tree and enjoy the benefits of a greener backyard! LEAF only plants species native to Ontario - species that evolved here as opposed to those brought by humans from other areas. The number of trees and shrubs we can plant in your yard may be limited, based on your municipality, the age of your home, and the space you have available for planting. We only plant in backyards or fenced-in side yards. If you wish to plant in your front or side yard, please use our Do-It-Yourself program option. We will provide only trees and shrubs that suit your yard conditions. Species choice may be limited based on your soil type, available sunlight, and geographic region. We do not plant in yards where major landscaping or construction is underway or will be underway in the near future, as this may damage new trees and shrubs. Please be sure to read through the Ordering & Cancellation and Our Guarantee, Your Committment sections below for more detailed policies that apply. If your yard meets our minimum space requirements, you can complete our online application found at the bottom of this page. Once we receive your application, we will contact you to book your site consultation with one of our arborists. The sooner you book your site consultation, the wider the selection of trees and shrubs you will have to choose from (our program operates on a first-come, first served basis so some species may be limited). You will need to be available for a two-hour window during working hours on a weekday. A limited number of evening and weekend appointments are also available. What are your reasons for wanting a tree or shrub? Are there specific characteristics you’re looking for? Are there specific characteristics that you do not want your tree or shrub to have? 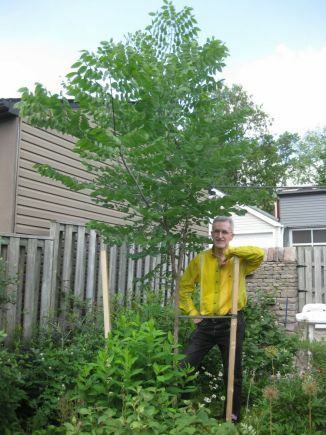 How large do you want your tree or shrub to get? How tall? How wide? Is your yard sunny or shady? Do you have other trees and shrubs on your property and neighbouring properties? Are they full grown or will they get bigger? Is your house in a new development? Will you be doing any renovations or building a deck in the future? Are you interested in ordering native garden kits, cedars or pawpaw trees? It is essential to ensure your yard meets our minimum space requirements for trees before booking a site consultation. Complete a siting form which will also act as your receipt. If you do not own the property you should have the property owner present for the site consultation, or provide a letter of permission signed by the property owner. It must be printed, signed and returned to LEAF by email, fax, or post prior to your site consultation. Your arborist will take payment in full for your order at the end of your consultation. LEAF accepts payment by cash, cheque, VISA, and Mastercard. If for any reason you decide not to purchase a tree at the time of the site consultation, there is a $75+HST charge for the site consultation. Your site consultation is valid for the current planting season, so if you make the decision to purchase a tree following your site consultation, the $84.75 you have paid will be deducted from the cost of your order, provided no species or location changes have been made. If you decide to order only shrubs and/or garden kits at the end of your site consultation, you must pay the $84.75 site consultation fee PLUS the cost of your shrubs and/or kits. The cost of the site consultation is included only when you order a tree. We require 2 business days' notice for site consultation appointment cancellations or a $40 fee will apply. After species selections are confirmed and payment is made, any changes to your order must be approved by an arborist and a $15 administrative fee may apply. If you wish to cancel a paid order, we keep $75+HST for the cost of the consultation, as well as 25% of the cost of the remaining order. We will refund the rest using the original payment method. We will notify you two days prior of your planting date, but unfortunately cannot provide you with a specific time of day. In order to maintain the most efficient planting routes, we are unable to accommodate any scheduling requests. You do not need to be home on the day of planting, as long as we have access to your backyard. This means that any gates must be left unlocked all day. If we are delivering shrubs that you are planting yourself, they will be left in your backyard, along with some extra mulch. They should be planted as soon as possible. Be sure to water them every day until planted as the pots dry out very quickly! Ready to get your tree? Please complete and submit the application, and we will be in touch to book your site consultation!